Washington NFL trademark: Judge orders trademarks cancelled, but team likely to appeal. 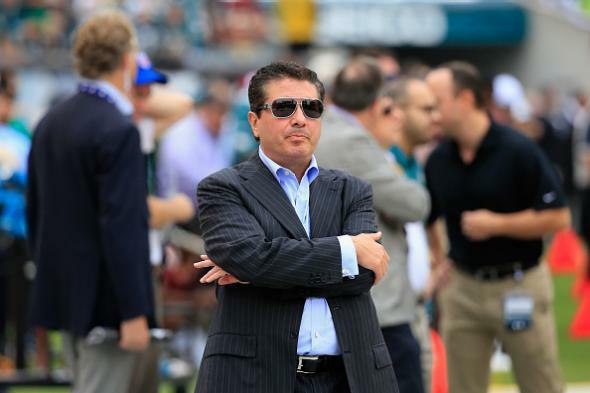 Washington NFL franchise owner Dan Snyder at his team’s game with the Philadelphia Eagles in September 2014. Washington lost. This doesn’t, however, mean the team will be forced to stop using its nickname, only that it may eventually lose certain trademark protections. As the Washington Post notes, the cancellation doesn’t go into effect until the team has “exhausted the appeals process in the federal court system,” and protections are still available at the state level. Washington finished last season with a record of 4-12 and has only won a single playoff game during the 16-year tenure of current team owner Daniel Snyder.